I restarted from Windows (under Boot Camp) via Restart in OS X..., which I've done many times before. This time, my MacBook restarted and stayed black for a while. I eventually held the power button to reboot it. It eventually came back up to a Reset Password recovery screen. I tried restarting and holding Option to select the Macintosh partition, but it always comes back to Reset Password. I didn't forget my password. What's going on? 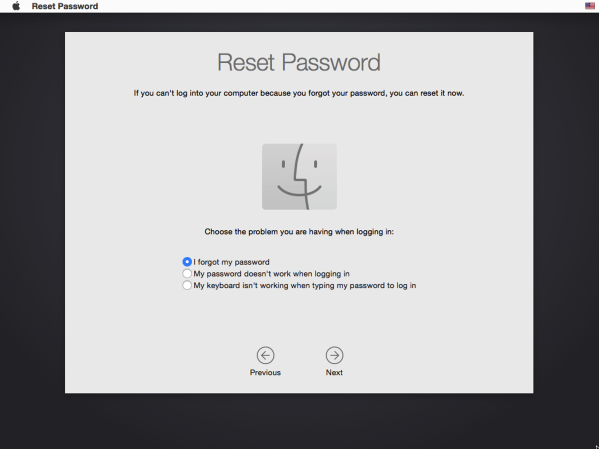 OS X Yosemite has a troublesome password reset screen you can access by turning your computer off and back on from the login screen. However, once you do this, there is no way out. The "Reset Password" boot wizard offers no exit without reseting your password. If you restart your Mac, you will end up right back in the wizard. The solution is a PRAM reset: Command-Option-P-R during bootup. Not the answer you're looking for? Browse other questions tagged macos macbook yosemite bootcamp . I removed Boot Camp the hard way, but then I got a Windows error anyway. Should I be concerned?